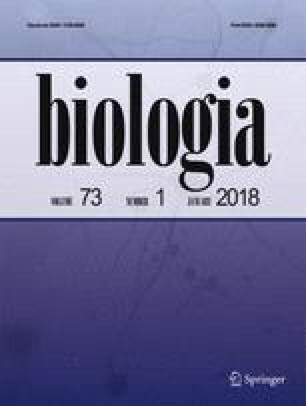 In Slovakia, a diversity of entomopathogenic fungi (Ascomycota, Hypocreales) associated with outbreaks of Ips typographus was studied in 81 localities and as many as 113 in vitro cultures of five entomopathogenic species were isolated from infected individuals: Beauveria bassiana (87 isolates), B. pseudobassiana (14 isolates), B. caledonica (6 isolates), Lecanicillium lecanii (4 isolates) and Isaria farinosa (2 isolates). B. pseudobassiana is recorded in natural populations of I. typographus for the first time. Biological properties of selected Beauveria isolates, including colony growth, biomass production, conidia yield and pathogenicity to I. typographus adults, were studied in a series of laboratory bioassays and much intra- and interspecific variability was detected. B. bassiana isolates produced biomass or conidia at significantly higher rate than B. pseudobassiana and B. caledonica isolates. Two B. bassiana isolates were selected as the most virulent to bark beetle adults, demonstrating a mean LC50 ranging from 0.72 to 2.05 × 106 conidia ml−1, and were qualified as promising candidates for biocontrol of I. typographus. Their virulence was significantly higher than that of the mycoinsecticides Boverol®, which was used as a reference strain in the virulence bioassays. The online version of this article ( https://doi.org/10.2478/s11756-018-0005-x) contains supplementary material, which is available to authorized users. This research was funded by the Operational Program of Research and Development and co-financed with the European Fund for Regional Development (EFRD). Grant: ITMS 26220220087: The development of ecological methods to control chosen forest pests in vulnerable mountainous regions of Slovakia.